In fact, it is a common Windows button control (of class “Button“) that has BS_COMMANDLINK or BS_DEFCOMMANDLINK type style set. We’ll further show how to deal with such type of controls in our own aplications. If working with Microsoft Visual Studio 2008 or newer, then we can find “Command Button Control” in the resource editor toolbox. So first, we just have to drag it from toolbox in the resource dialog template. The label text can be set at design time by changing the Caption property; it can be also changed at run-time by calling CWnd::SetWindowText. The additional explanatory text has to be set at run-time by calling CButton::SetNote. The default arrow icon can be changed at run-time using CButton::SetIcon. Further, we can work like with any other classic push button, as for example handling BN_CLICKED notification. Command Link Button controls are available in Windows Vista and newer. For for additional environment info, see “Build Requirements for Windows Vista Common Controls” link below. In raw-WinAPI applications (not using MFC), can use the corresponding Windows SDK functions/macros instead of of CWnd/CButton methods. // Set additional explanatory text (send BCM_SETNOTE message or call Button_SetNote macro). …add to dialog template a Custom Control. As shown in the image, you must set “BUTTON” class property and “0x5001000e” style property (WS_CHILD|WS_VISIBLE|WS_TABSTOP|BS_COMMANDLINK). Also, in the source code you have to send BCM_SETNOTE message instead of calling CButton::SetNote. For more details, see the attached VS 2005 demo project. 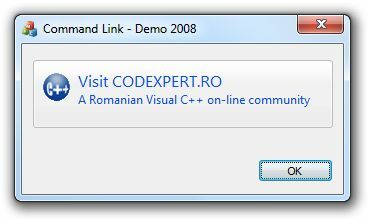 This entry was posted in MFC, Uncategorized, Visual Studio and tagged Button Control, Command Link, mfc, Vista controls, Visual Studio on 2013.01.31 by Ovidiu Cucu.